How Far Will This Rally Take Us? Look how far we’ve come! In early March there were almost no S&P 500 constituents trading above their short term moving average and now we have the opposite, very few that aren’t. The last time the market reacted like this was in March 2007. Another interesting aspect of the rally is that it is commonly referred to as a “bear market rally”. Very very few are calling it the beginning of something more. But those few, like Doug Kass and Jeremy Grantham, who are making such a bold claim, do have an impressive track record in timing the market. On the other hand, the average investor out there, as measured by the popular sentiment indicators has hastily jumped aboard and suddenly turned very optimistic. It seems that a few gravity defying days are all it takes to make them forget that just a few weeks ago they were extremely gloomy about the outlook of the market. 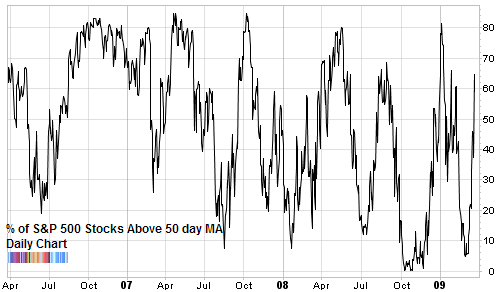 By this measure of breadth, the market technically still has some room to go up but it is getting up there into thin air territory. One insight which I think is obvious when you look at both these charts is that a major inflection point usually occurs when an extreme is confirmed by both of them. For example, take a look at October 2007 and again on January 2009. Everybody and their uncle was expecting a bear market rally and it arrived with the usual vigor. The question now is, how will it fare on its first real test. 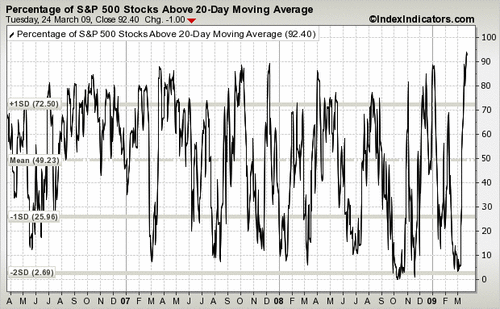 Price is bumping its head on resistance at 800 and the market breadth is stretched to the upside. Even if this is the “real thing” don’t be surprised if price pauses here to catch its breath or retraces a bit. Jeff deGraaf (a top-rated TA) was fastmoney on Mar 16, 2009 (see video a cnbc.com). deGraaf sees the current rally as the most important bear market rally of the last 100 years. Shawn, that sounds about right. It is amazing that 50 Days MVA ratio is 83.57. Will it go to 100 and stay there?